As early as the 1890s Germans, the British, and Americans could buy disposable menstrual pads. Johnson & Johnson made the American pad, Lister's Towel. Dr. Lister was the great English proponent of antiseptic surgery. 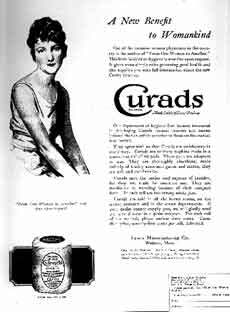 Curads (see words), which makes bandages today, advertised a disposable sanitary napkin at least as early as 1920 (left, a full page in Vogue magazine), but it was left to Kotex (the word was created from COTten-like TEXture) to finally make a widely sold disposable pad for menstruation, in this case made of cellulose (wood pulp). 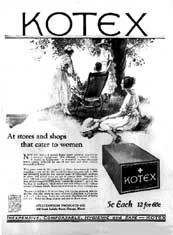 In its first ad, in January 1921, (right; read words and read about the first Kotex ad campaign), the company explained the menstrual pad's origin as a bandage for soldiers in World War. American nurses in France tried it as a menstrual napkin, liked it, and well-to-do women made another step toward freedom; it wasn't cheap. But the new sanitary napkin only sold well after women were allowed to put money into a container without speaking to a clerk, and to take a box from a stack on the counter.That was the brilliant idea of the ad man Albert Lasker, for whom the Lasker Awards in medicine are named. Next page of Inside MUM!